The ideal taxi booking app for people on the go in Liverpool. Excel private hire Liverpool Taxi booking app is the most user friendly taxi booking app on the market. Once you have downloaded our free app, just follow a few simple on screen steps and you’ll be up and running in no time at all. 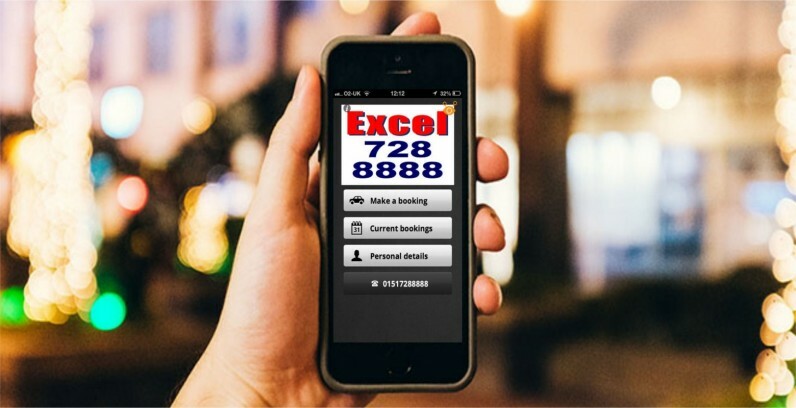 Our app offers a convenient easy way to book an Excel taxi. Even if you are not to sure exactly where you are the app can find your location via GPS. An approximate price for your journey will also be shown, if you add a destination. Once you have used the booking app a couple of times your favourite pick up points will be logged by the app. Making future bookings will be quicker and easier with your stored pick-up’s. With Excel private hire Liverpool Taxi booking app, you can check the status of you booking and track your taxis progress via the app in real time once the job is dispatched to a vehicle. Download the app now to book a taxi with Excel – Liverpool’s Lowest Fares. Follow the below link to download our free taxi app.